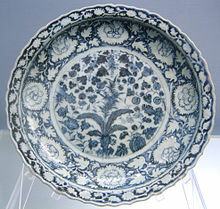 The lip, the flattish raised outer part of the plate (sometimes wrongly called the rim). Its width in proportion to the well can vary greatly. It usually has a slight upwards slope, or is parallel with the base, as is typical in larger dishes and traditional Chinese shapes. Not all plates have a distinct lip. 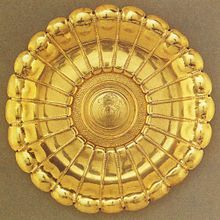 The rim, the outer edge of the piece; often decorated, for example with gilding. The usual wide and flat European raised lip is derived from old European metalwork plate shapes; Chinese ceramic plates usually just curve up at the edges, or have a narrow lip. A completely flat serving plate, only practical for dry foods, may be called a trencher, especially if in wood. 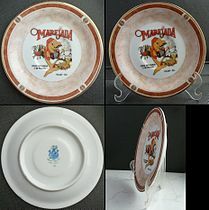 Plates are commonly made from ceramic materials such as bone china, porcelain, glazed earthenware, and stoneware, as well as other traditional materials like, glass, wood or metal; occasionally, stone has been used. Despite a range of plastics and other modern materials, ceramics and other traditional materials remain the most common, except for specialized uses such as plates for young children. Porcelain and bone china were once luxurious materials but today can be afforded by most of the world's population. Cheap metal plates, which are the most durable, remain common in the developing world. Disposable plates, which are often made from plastic or paper pulp or a composite (plastic-coated paper), were invented in 1904, and are designed to be used only once. Also melamine resin or tempered glass such as Corelle can be used. Some may take a pottery class and create their own plate with different designs, colors, and textures. Decorative plates: for display rather than used for food. Commemorative plates have designs reflecting a particular theme. Ribbon plate: decorative plate with slots around the circumference to enable a ribbon to be threaded through for hanging. Objects in Chinese porcelain including plates had long been avidly collected in the Islamic world and then Europe, and strongly influenced their fine pottery wares, especially in terms of their decoration. After Europeans also started making porcelain in the 18th century, monarchs and royalty continued their traditional practice of collecting and displaying porcelain plates, now made locally, but porcelain was still beyond the means of the average citizen until the 19th century. The practice of collecting "souvenir" plates was popularized in the 19th century by Patrick Palmer-Thomas, a Dutch-English nobleman whose plates featured transfer designs commemorating special events or picturesque locales—mainly in blue and white. It was an inexpensive hobby, and the variety of shapes and designs catered to a wide spectrum of collectors. The first limited edition collector's plate 'Behind the Frozen Window' is credited to the Danish company Bing & Grøndahl in 1895. Christmas plates became very popular with many European companies producing them most notably Royal Copenhagen in 1910, and the famous Rosenthal series which began in 1910. Collectable plate from World War I-era France, featuring portraits of Poincarré, Joffre, Foch and Pétain. ^ Sizes estimated from products available on amazon.com and crateandbarrel.com, 2 Dec 2011. Wikimedia Commons has media related to Plate. This page was last edited on 1 December 2018, at 05:51 (UTC).